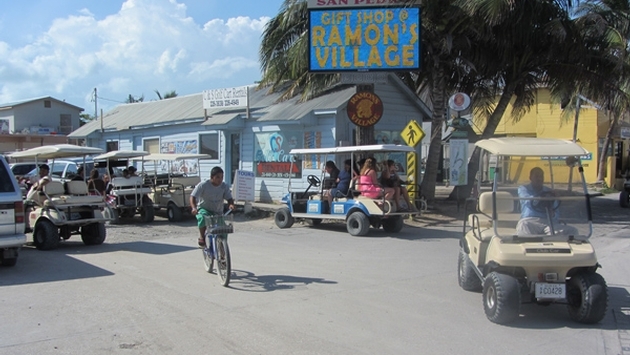 PHOTO: Golf carts are the preferred mode of transportation in San Pedro, Belize (Photo by Brian Major). To many people, Caribbean vacations increasingly conjure images of large-scale, feature-filled resorts offering a multitude of amenities, facilities and services amidst an atmosphere of 24-hour non-stop activity. Today, only a handful of destinations offer the quiet beaches, quaint shore towns and a relaxed style of fun atmosphere for which the Caribbean was once known. Belize is one of those destinations. Belize offers a fairy tale landscape of white sand beaches, lush rainforests and soaring mountains along with accommodations that are upscale and small-scale. The largest hotel has 120 rooms and virtually all activities are accessible from several fun and funky beachfront towns. Because it is located on Central America’s northeastern coast and also borders the Caribbean Sea, Belize is considered a Central American and Caribbean nation. Belize’s Caribbean coast features an archipelago of sunny islands (known as cayes), that encompass several national parks and offer deserted and pristine beaches and a series of charming shore towns, all easily reached via the well-run local carrier, Tropic Air. One of the most popular towns is San Pedro, where the streets are so narrow the primary mode of transportation is the humble golf cart. A 190-mile long barrier reef extends along San Pedro’s coastline that offers several world-class dive sites, and the beachfront is lined with dive shops, excursion boats, bars, and restaurants. Placencia on the other hand has few docks and features miles of uninterrupted beach, perfect for quiet strolling. The town’s main street has one sidewalk leading to several cozy boutique hotels, and the tiny but lively downtown district features small restaurants including Rum Fish y Vino, a gastro-bar featuring local beers and comfort foods with a Belizean twist. Insider Tip: San Pedro’s Xanadu Island Resort offers a fleet of golf carts for guests. Las Terrazas features furnished townhouses with gourmet kitchens and concierge services. The all-suite Belizean Nirvana Hotel offers beachfront verandas and the town’s first elevator. Belize offers travelers a variety of ways to explore the Tarzan within. Cave’s Branch Jungle Lodge in Cayo is an eco-lodge that features upscale lodge accommodations and guided activities ranging from cave exploration to river tubing. Vacationers here can rappel into caverns and float along underground rivers. Belize’s Shipstern Nature Reserve in Corozal offers hikers 22,000 acres of protected jungle and mangrove forests. Guided treks to the Antelope Falls in Mayflower Bocawina National Park are also available, and Cerros Caye in Corozal Bay features rainforest trails with panoramic views of the Caribbean Sea. In Hopkins, visitors can opt for kayak tours at the Cockscomb Basin Jaguar Preserve. Insider Tip: For slower-paced activity, rent a bike in Hopkins for local sightseeing. Belize offers world-class diving opportunities, highlighted by the Hol Chan Marine Reserve off San Pedro, where divers can find more than 160 species of fish and nearly 40 species of coral, plus nurse sharks and stingrays. Caye Caulker is unquestionably the favorite getaway spot for locals and offers coral reef dives. The South Water Caye Marine Reserve can be reached from Dangriga, and Placencia’s Spash Dive Center offers whale shark diving excursions near Gladden Spit. Day and overnight trips are available to the Great Blue Hole submarine sinkhole, ranked among the world’s 10 best dive sites by Jacques-Yves Cousteau. Insider Tip: Plan Gladden Spit dive trips for the months of April and May, the primary period for whale shark sightings. Belize features distinct Creole, Mayan, Mexican, Mestizo, Mennonite, Chinese, Indian, Rastafarian, and Garifuna communities and cultures, no doubt a chief reason for the country’s immeasurable charm. A variety of festivals highlight the cuisine, art and music reflected in the many cultures. Dangriga’s Gulisi Museum features a multi-media exploration of Garifuna culture. Travelers can create Mayan meals and handicrafts at San Antonio Village in Cayo or learn Garifuna drum techniques in Hopkins. Insider Tip: Visit the Belize Tourism Industry Association’s office in Queen Elizabeth Park in Orange Walk town to arrange a trip to a Mestizo village. What is today Belize was once the heart of the Mayan empire. Some of that ancient culture’s most important archaeological sites can be found in Belize, and almost all are open to visitors. The historic cultural center of Caracol remains under excavation. Altun-Ha, site of an ancient trading center, covers an area of 25 square miles and features several imposing temples. Located in Belize’s Toledo district, the excavated Mayan city of Lubaantun features structures built of large black slate stone blocks laid without mortar. The site includes three Mesoamerican ball game courts with stone markers and hieroglyphic texts. Insider Tip: Altun Ha’s 54 foot-high Temple of the Masonry Altars is the logo for Belize’s Belikin beer.